The months of October and November are full of festivals with number of feasting opportunities. Now, when we talk about Indian festivals, sweets are a must to be made at home or brought from the market to relish and celebrate. Barfi, shahi tukda, jalebi, malpua, phirni, kheer, etc are to name few of the delicacies out of which I thought to make Kheer the unusual style. 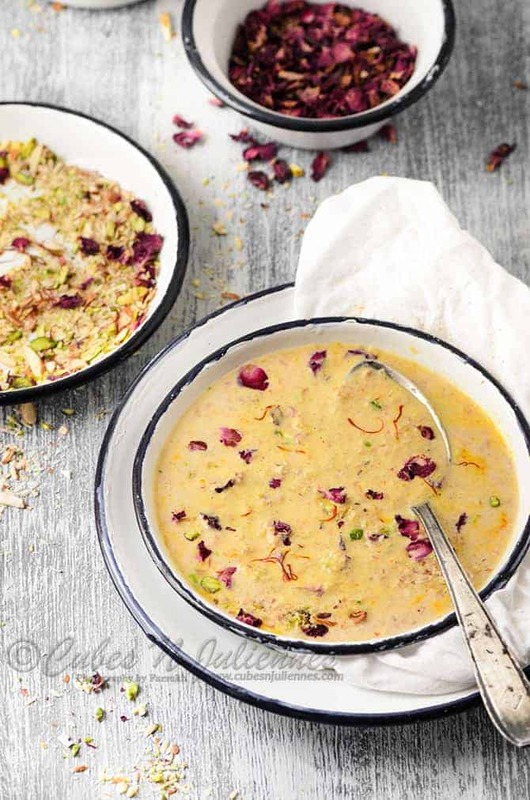 Here I have added dried Desi Gulab (edible Rose) petals in kheer, which can be made with very simple steps and the outcome is divine……. Add rice and simmer for 15 minutes. Keep stirring intermittently. 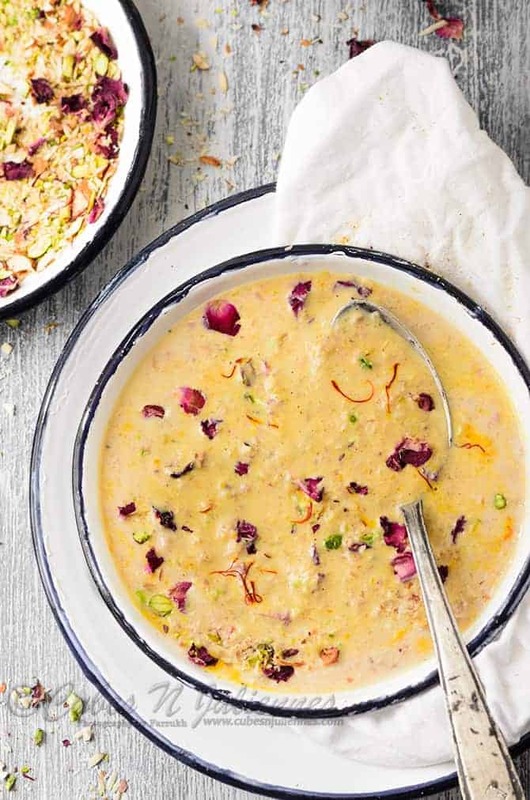 Add crushed rose petals, crushed cashew nuts, cardamom powder and cook till the milk reaches the consistency of a kheer (reduced to half of the original quantity). Keep stirring intermittently to avoid burning. Now, finally add sugar and saffron, simmer for another few minutes till the sugar is dissolved well. Take it off the stove and cool it for sometime. Chill it for few hours in refrigerator. 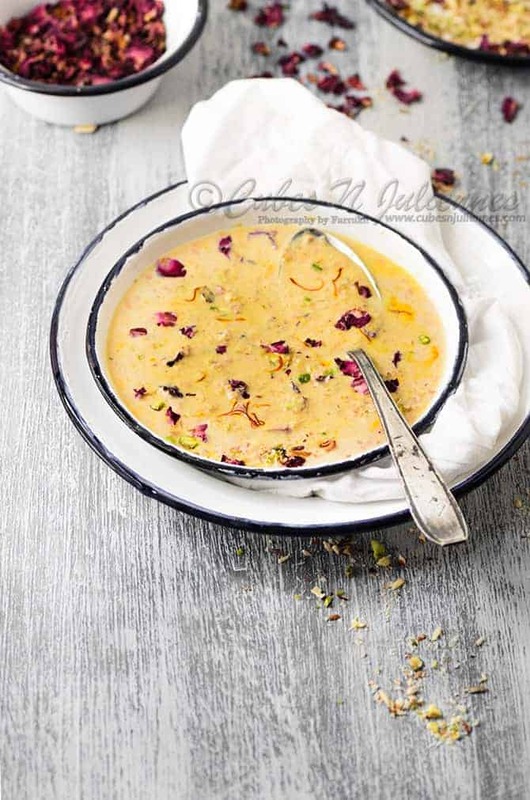 While serving, garnish with slivered almonds, pistachios, rose petals and saffron. Enjoy !! If dried petal are not available, you can also use fresh petals, but use the organic rose which is available in local market, do not use the hybrid ones. 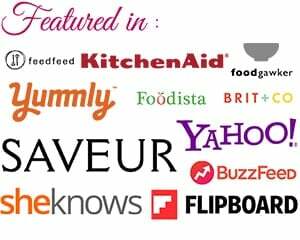 Anjeer ki Kheer – Guest Post for Rafeeda of The Big Sweet Tooth !! I didn’t like cooking food but after reading your article I will start cooking. I want to cook my students. 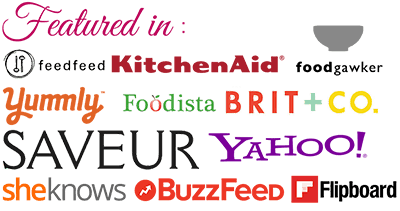 Please visit my website to recommend me to recommend me a recipe . .